On the "General" tab (Figure�1.1) you can choose to automatically reopen the last used song and/or playlist. This can save you the trouble of having to reopen the song you are working on every time you open Hydrogen. Auto loading the playlist can come in handy when you are using Hydrogen live. The Max number of bars in a song can be set here (currently limited to 800) and if you want to use rubberband for sample time-streching (see Section�9.5.2) you need to enter the path where rubberband is installed on you system here. 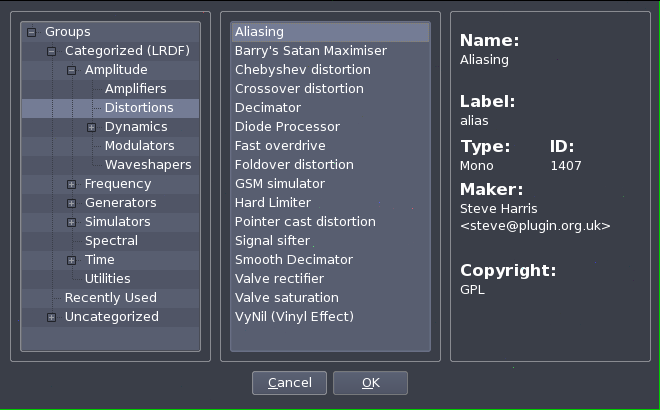 From the "Audio System" tab (Figure�1.2) it is possible to modify the audio driver being used (OSS, Jack, ALSA, PortAudio, PulseAudio, CoreAudio) with its buffer and sampling rate (unless you are using JACK, in this case the audio driver configuration should happen before starting the JACK server). jackd: The Jack driver is a professional audio server which permits very low lag and exchanges with other audio software. We strongly recommend using this driver to have the best out of Hydrogen. JACK server will start automatically if not already running. The "Midi System" tab (Figure�1.3) contains all MIDI settings. Here you can choose the MIDI driver (ALSA, PortMidi, CoreMidi or JackMidi) input, and channel(s) that Hydrogen should respond to. See Section�10 for more info on Midi actions. The "Audio Engine" tab (Figure�1.5) is a window that shows various stats about Hydrogen and the audio driver. In case JACK is used, buffer and sampling rate should be set before starting Hydrogen (JACK automatically starts when an application tries to connect). Projects: this menu offers file related functions. Import library - Imports another drumkit from the local filesystem or download it from a remote location through an XML feed. The XML file that should be provided is NOT RSS compliant (see Hydrogen website for an example). To load another drumkit in your current working session of Hydrogen, read Section�8. Mixer - Open the mixer window. Instrument rack - Open the instrument rack panel. Preferences - Open the main preferences window. Read Section�3 on how to configure Hydrogen. debug action - Insert debug commands. Set Pattern/Song Mode. When Song mode is selected Hydrogen will play the complete song. This is the sequence of patterns you have created in the Song Editor (see Section�5). When Pattern mode is selected Hydrogen will play the pattern that is currently selected, and thus displayed in the Pattern Editor (see Section�6). Set measure type and Beat Counter (see Section�4.1). The "Song Editor" (Figure�2.4) gives an overview of the whole timeline of the song (e.g. intro, verse, bridge, chorus and so on); each blue colored square on this panel represents a complete bar as shown in the underlying "Pattern Editor" panel. The song editor gives you complete freedom to add/remove patterns to the song and to move or copy any part of your song. For more info on this see the SELECT_NEXT_PATTERN midi action in Section�10. Note Length / Note off : these are 2 different ways to define the duration of a note. See Section�6.3 for usage. Drum mode (see Figure�2.7) focuses on using Hydrogen as a drum machine. If you are using Hydrogen as an instrument there is a big chance that the Piano mode is for you. It gives you a complete 'piano keyboard' so you can easily put down your tunes. The Mixer consists of 3 sections (left>right) : the instrument channel strips, the FX plugin rack and the master fader section. The Hydrogen Mixer works very much like a hardware mixer does : it lets you set the volume, pan, FX and several other things for every instrument. Note that Hydrogen can also be switched to 'per instrument output' mode (see Section�3.2), and in this mode all channel strip outputs will be available in Jack (not just the Master output). This allows you to route the individual instruments directly into any other Jack enabled application (eg Ardour) and gives you a lot more flexibility. First of all a little history on the Sound library and Drumkits. Hydrogen began as a dedicated drum machine but has evolved into a versatile sound synthesizer/sequencer that is capable of generating and manipulating all sorts of sounds. Hence the original "Drumkit" terminology is slightly misleading. You can load any kind of sound into a "Drumkit" and manipulate that sound just like playing a regular synthesizer. This is also the main reason why the Piano mode was added to the pattern editor (see Section�6.5). The amount of time to go from 0 to full velocity. The amount of time to go from the sustain volume back down to 0. In the next paragraphs we will show you how to create a complete drumkit. Keeping in mind the 'Soundlibrary hierarchy' (see Figure�2.12) we will use a top-down approach, so we will start at the Drumkit level and work our way down to the samples. TIP : Instead of creating your own drumkit, you can also use or download existing drumkits using the Section�8. Gain: The overall volume of the instrument. It's important that you understand Section�9.1 in order to continue on. Underneath these 2 windows you can find (from left>right) : the position of the Start marker, the position of the Loop marker, the Loop mode, the number of loops and the position of the End marker. The position of the markers is expressed in number of samples from the very beginning of the sample. These values will change if you drag the markers, but you can also fine-tune the marker position by using the up/down arrows of the spinboxes, the up/down keys on your keyboard, or by using your mouse scroll wheel while hovering above the spinboxes. If you are using Ubuntu you can install rubberband from the Software Center (rubberband-cli). For other linux distros check your package manager. For other platforms please check the rubberband site . After installing rubberband you should check if the path to the rubberband cli is configured correctly (see Section�3.1). In this section you can find more info about defining MIDI actions and how they can be useful for you. Before you can work with midi actions you should have your Midi devices, drivers and connections configured correctly (see Section�3.3). The Param. (parameter) value to the right of the Event is the identifier of the note/button/controller that is linked to this Action. This parameter can be entered manually, or automatically by using the Midi learn function (see Section�3.3). Hydrogen has 2 main modes: "Pattern" mode and "Song" mode (refer to Section�4 for the buttons that activate each mode). When "Pattern" mode is activated the current pattern is continuously repeated. This mode is very well suited to tweak your pattern until it's just right, since the pattern you are working on is constantly repeated. This way you can immediately hear the changes you have made. In "Song" mode the whole song is played. This is useful when putting together the patterns to create the structure of the song. We'll start from the empty song with an empty pattern created when Hydrogen starts up: "pattern" mode should be selected by default. Now let's click on the “Play”button, and while the pattern is playing let's add notes by left_mouse_clicking in the grid of the Song Editor (Figure�3.1). Adjust the grid resolution and BPM speed if needed. Remember some constraints of the grid: if you are working with a resolution of 16 you can't go back to 8 and remove a 16th note; same thing happens if you are working with a resolution of 8 and you try to insert a note in the middle of two bars (looking for a 16 bars precision): they will be placed on the previous or on the following 8th bar (unless you choose “off” from the Grid Resolution LCD in which case you're free to place notes wherever you prefer). Be sure to select the correct pattern in the Song Editor before adding notes in the Pattern Editor! Once patterns are created (Figure�3.2), we can copy/paste/delete them using the Select Mode (see Section�5.1). Of course we can always use the mixer window, either when creating or playing patterns. The Mixer frame (Figure�3.3) is made of 32 independent tracks, each of these is bound to an instrument, plus a "Master Output" control and a "FX" button to show and hide the effects panel. Every line features 3 buttons ( ), pan adjust ( ), current maximum peak, volume fader and name of the track. Clicking on will play the selected instrument, cutting the others. The "Mute" button , simply mute that instrument. The maximum peak indicates the maximum volume reached from the instrument. The peak must be in a range of 0.0 and 1.0 (in Figure�3.3 you can see a few volumes too loud). Peaks outside that range will get distorted (especially with OSS audio driver). Keep an eye on each vu-meter and if distortion appears, turn the volume down for that instrument. See Also Envelope Generator, Attack, Decay, Sustain, Release. See Also Filter, High-Pass Filter, Low-Pass Filter. See Also Filter, High-Pass Filter, Low-Pass Filter, Resonance Filter. See Also Band-Pass Filter, High-Pass Filter, Low-Pass Filter, Resonance Filter. See Also Filter, Cutoff Frequency. See Also Filter, Cutoff Frequency, Resonance.